With nearly 250 million mobile users Mobile marketing is one of the latest trend to hit India. Bluetooth Marketing is one of the means of mobile marketing which is being experimented with by many brands. This technology has the advantages that it is permission-based, has higher transfer speeds and is also a radio-based technology and can therefore not be billed (i.e. is free of charge). Bluetooth marketing is done to those people who are in close proximity and have there bluetooth feature turned on. It could also prove to be an exciting tool to interact with a potential customer who might be shopping, walking in a mall or waiting for a traffic light to turn green. In recent times some of the brands have been using this feature in India. 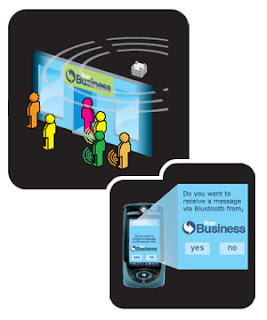 Lee created buzz about Bluetooth marketing when it launched a campaign in the malls of Bangalore and Mumbai in 2006. The Super Fit campaign distributed a FitFinder application through Bluetooth to help customers find the perfect fitting jeans. The Bluetooth campaign had a PoP (point of purchase) message that offered an m-coupon with a discount of 10 per cent if a customer answered some queries about the brand. When Motorola launched a Bluetooth campaign for its handset MotoRokr in Delhi, Mumbai and Bangalore in 2007, a message was sent to the mobile handsets that had their Bluetooth switched on, offering a look at the new handset and a 20 per cent discount on its purchase. “Every day, we had 40-50 walk-ins at Motorola outlets in each mall,” says Lloyd Mathias, director, Motorola. More recently, Indigo Nation launched a game based Bluetooth campaign in select Indigo Nation outlets in Bangalore. The four level game can be downloaded via Bluetooth and offers discounts as rewards as players clear each level Indigo Nation has so far received redemptions of about 2 per cent from people who have downloaded the game. However there are various reasons which are hindering the rise of this kind of marketing firstly the technology not many users are aware about bluetooth technology , secondly this is a very technology intensive field and thirdly there are privacy issues and brands could be associated with spamming.